Sadly I doubt news that the DVB Steering committee has finally rubber stamped the Phase I DVB-UHD 4K TV spec will herald any great rush (or even a stumble) to mainstream 4K TV broadcasting any time soon. My last chat with Ilse Howling, Freeview MD in the UK, was unambiguous on the subject. "It's not in our plans," I was told. "Here at Freeview we want to just keep pace with the needs of our customers. I really don't think Freeview is about being cutting edge; what we tend to do is look at innovation and then follow it. Digital was pretty much established before Freeview launched, and so it was with Freeview HD." The biggest sales hook for Freeview viewers remains HD. 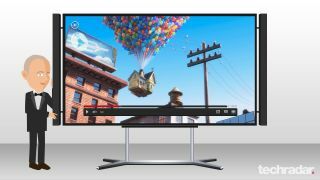 So there's probably no point postponing your 4K TV purchase waiting for DVB-UHD tuners to turn up - because by then the DVB Steering committee will only just be thinking about ratifying the Ultra HD Phase 2 specification, which adds go-faster stripes and fins. The reality is that Ultra HD, at least in the UK and Europe, will likely remain the preserve of Pay TV operators like Sky, who'll be looking to unlock new revenue streams to justify any investment in channel infrastructure and set top box hardware costs. High-bandwidth Digital Content Protection can be used to secure the transmission of digital assets, be they broadcast or media. Without a device-to-device handshake, HDCP 2.2 delivered content isn't going to make it onto any screen. Unfortunately HDCP 2.2 chip availability is trailing behind 4K product roll-outs. Home cinema manufacturers have been rushing to release new AV receivers with 4K capable HDMIs, yet only one AVR brand has implemented HDCP 2.2 and that's Onkyo. Five of its new receivers, plus one processor, offer the copy protection, albeit on a single HDMI (STB/DVR). The chipset used is the Silicon Image SiL9679, currently the only solution available to any equipment manufacturer. The catch is that the SiL9679 doesn't support the full 4K 4:4:4: colour space; it's a compromise 4:2:0 solution, created for deployment in UHD displays. This, I was told by representatives of both Yamaha and Denon is why their AV receivers don't implement the SI solution: 'We want to offer our customers the ultimate 4K experience," they told me as if one "and that means ensuring our 4K HDMI products support the full 4:4:4 colourspace." The message to buyers is that they can be future-proofed with Onkyo, but possibly sacrifice some colour fidelity - or gamble with its rivals and potentially revel in all the colours that technology allows (just for fun let's assume that we'll be able to tell the difference between 4:4:4 and 4:2:0). Of course the usual 4K caveats apply. There is no 4:4:4: UHD content available (maybe Blu-ray 4K discs will offer it, if studios ever agree to launch them). Panasonic's DMC-GH4 system camera shoots 4:2:2. Regardless if Sky adopts 4:2:0 or 4:4:4, any HDCP 2.2 set top box implementation could render swathes of currently available 4K kit incompatible. Chris Pinder heads up HDConnectivity, video distribution specialists for the custom install industry. "Yes I see trouble ahead," he confided to me. One complication is backwards compatibility, he says. "An HDCP 2.2 device would not work in the mix with any (currently available) HDCP 2.1 (and below) TV or sources. Everything has to be 2.2." Pointedly Pinder points out that the likes of Sky may actually have no intention of implementing HDCP 2.2, simply because the chipset would not only drive up the cost of any new HEVC Sky box but limit compatibility with available 4K displays. Conversely, a 4K Blu-ray player could circumnavigate the HDCP 2.2 headache by offering two HDMI outputs, with one going directly to the screen (which would then also need to be HDCP 2.2 compliant). But we could speculate until we go 4:4:4 blue in the face. If all this is all beginning to sound like a hideous mess, that's because 4K UHD's standards are a hideous mess.